SAN ANTONIO (AP) Tony Parker was an emotional wreck before his first game of the season. Mavericks: Dallas has made at least 10 3-pointers in 16 of 21 games this season, including 14 of 32 against San Antonio. … Dallas will complete its four-game series against San Antonio before Christmas, with the teams scheduled to play Nov. 27, Dec. 12 and Dec. 16. … The Mavericks have won consecutive games only once this season. 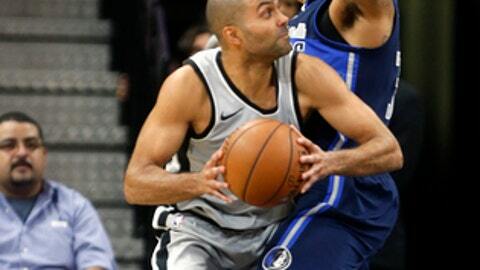 Spurs: Parker made his 1,131st career start, the most among active point guards. Houston’s Chris Paul is second with 839. … Parker said he expects Kawhi Leonard to return in ”two to three weeks” from a right quadriceps injury that has kept him out all season. … Aldridge has 20 points and 10 rebounds in seven games this season, the most in the team’s first 20 contests since Tim Duncan had eight in 2009. … San Antonio is 10-0 when scoring at least 100 points.